As we enter our 60th year in business (1959-2019), Manor Tool & Manufacturing would like to reflect on some of the exciting achievements that have helped us to continue to provide innovative metal stamping, tooling, and tool & die services and resources to our customers. From the publishing of our eBook, “Everything You Need to Know About Transferring Tooling” to receiving the 2018 Governor’s Export Award, we achieved a number of professional benchmarks, including becoming ISO 9001:2015 certified in a number of key areas. We were also thrilled by the successful installation of a 330-Ton Komatsu Servo Press Setup in our Schiller Park, IL, facility. This new press takes the shop’s already impressive advanced metal stamping capabilities to a new level. In our continuing efforts to usher the Chicago manufacturing industry successfully into the 21st century, Manor Tool gave two promising high school students valuable experience over their spring break. To keep our facility up-to-date and continue to serve our customers with excellent service, we installed a new press in 2018. This 330-Ton Komatsu Press is fully operational and available to meet customers’ stamping needs. It also has a COE SpaceMaster Compact Coil Line, which will increase our capacity by complimenting the capability of the servo press. For years, Manor Tool has offered a spring break internship program to give back to the Chicago manufacturing industry. In 2018, standout high school students Salvatore “Sal” Labarbera and Noah Guadalupe were selected based on their shared histories of mechanical and engineering classes and extracurricular activities. They spent the week learning what Manor Tool does, beginning with a facility tour and seeing how to operate a punch press. This was followed by an immersion in the various departments here, including engineering and design, sales, customer service, accounts payable, and ownership. In our unending effort to provide the best quality metal stamping products and services, Manor Tool & Manufacturing is proud to be ISO 9001:2015 certified in manufacturing precision metal stampings, deep drawn stampings, and machined components and assemblies for various industries, as well as design and construction of tooling. An ISO 9001:2015 certificate is the most well-known standard for quality management systems and is an important achievement in the industrial space, helping companies provide the best quality service and instilling peace of mind in their customers. Manor Tool published an eBook to educate both industry leaders and consumers on successful tool transferring called, “Everything You Need to Know About Transferring Tooling.” This resource offers guidance on preventing numerous common obstacles that decrease production and can derail it altogether, including old tooling, supplier quality, timeliness, minimizing risk, and industry-specific expertise. Vogel Tool & Die received the 2018 Governor’s Award for Continuing Excellence from Illinois earlier this year. Company president Tom Simeone accepted the award at an honoring ceremony that took place at Union League Club of Chicago on May 24th. Manor Tool will be working to continue building on these achievements and progress as we enter 2019. To become part of our continuing journey, contact us today for all your stamping needs. Manor Tool continues to invest in technology that will better serve our customers. The goal is to maintain an up-to-date facility that evolves continuously, and provides the efficiency and high ROI that customers expect. As you may know, this year we had the pleasure of installing a brand new 330 Ton Komatsu Servo Press in our facility. With this new servo press investment, we knew that an updated feed line, complimented with servo technology, would be required to have a complete setup for 2018. So today, we are excited to announce that our 330 Ton Komatsu Servo Press setup is complete. The 330 ton Komatsu press is up and running, available for immediate use, and has been equipped with a COE SpaceMaster Compact Coil Line, to complement the servo press’ capabilities and increase our overall capacity. 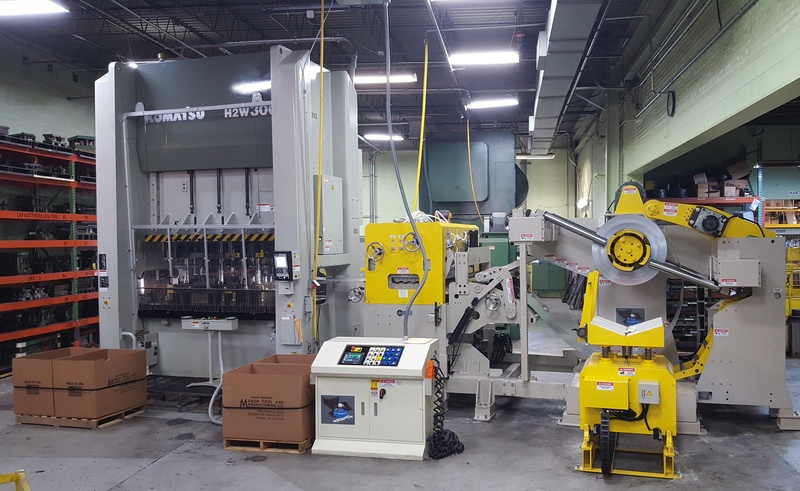 Manor Tool is excited to announce the installation of a brand new 330-ton servo press in our Schiller Park, Illinois, facility. This press will serve as an important addition to our shop’s advanced metal stamping capabilities.